Building on the success of Wrap Your Head Around It: Edition 1, Wrap: Edition 2 is underway. 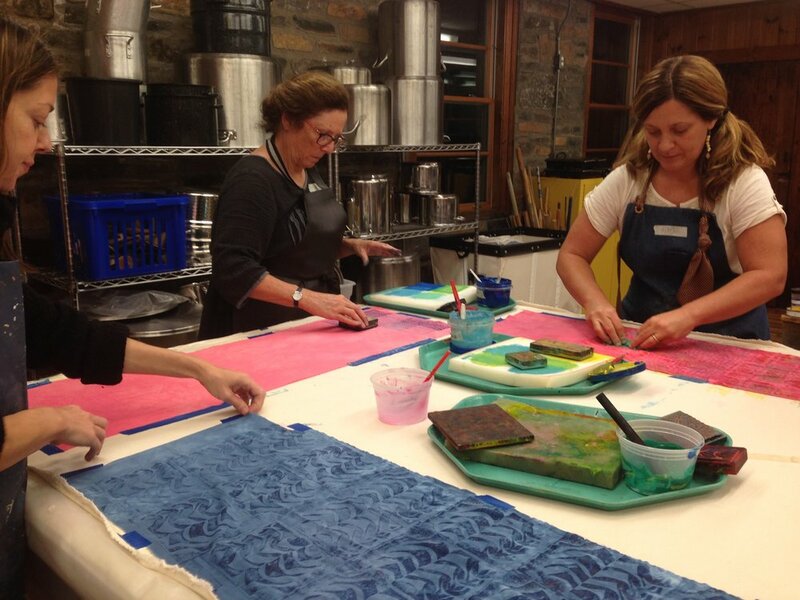 I have facilitated Pop-Up-Studio surface design sessions, a weeklong workshop at Penland and a series of sew-ins in North Carolina during the Autumn 2016 - generating a new collection of art scarves. For Cancer. Here is a glimpse of communities at work. Scarves have moved into many directions around the country. Fifty were routed to UNC Lineberger Comprehensive Cancer Center in Chapel Hill NC via the American Cancer Society's "Look Good, Feel Better" program. Read more about this joyous morning here. 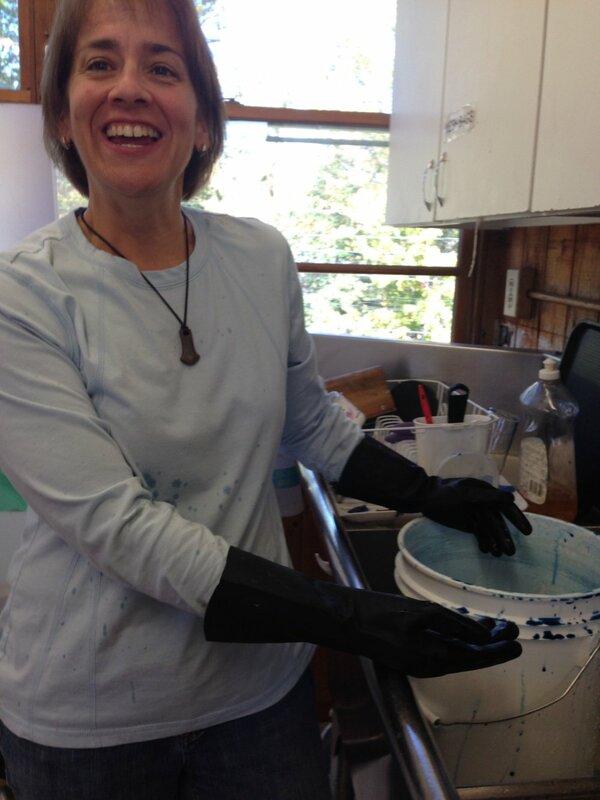 To prepare for the WRAP 2 week at Penland, I organized a couple of community dye / print days at a beloved coffee shop in Carrboro: JOHNNY'S GONE FISHING on October 5 & 6. This was made possible by the generous support of Dr. Jan Halle, retired oncologist. One hundred scarves will be routed to UNC Cancer Support Services. JOHNNY'S will host a celebration of scarves on December 13th, 2016. October 9-15, 2016, Penland School of Crafts hosted Wrap: Edition 2 workshop. It was an extraordinary week in which 7 women from different areas of the country came together to work nonstop creating a new inventory of scarves. 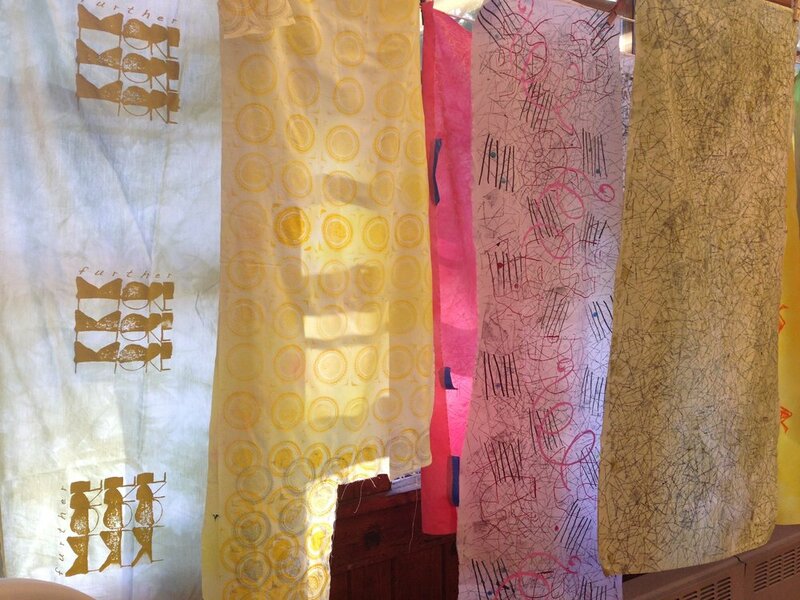 We dyed yards and yards of silk, printed with textile inks, drew, wrote and stitched. The studio was alive with color and ideas. My studio assistant, River Takada-Capel generously donated many yards of silk gathered from the Remnant Donation Program that she founded at Spoonflower. This was a huge boost to the project financially and visually. The gift of being able to experiment with different types of silk allowed for the loveliest expressions in color and texture. At the close of our week at Penland, fifty magnificent scarves were finished. Each and every scarf was unique and born of collaboration. 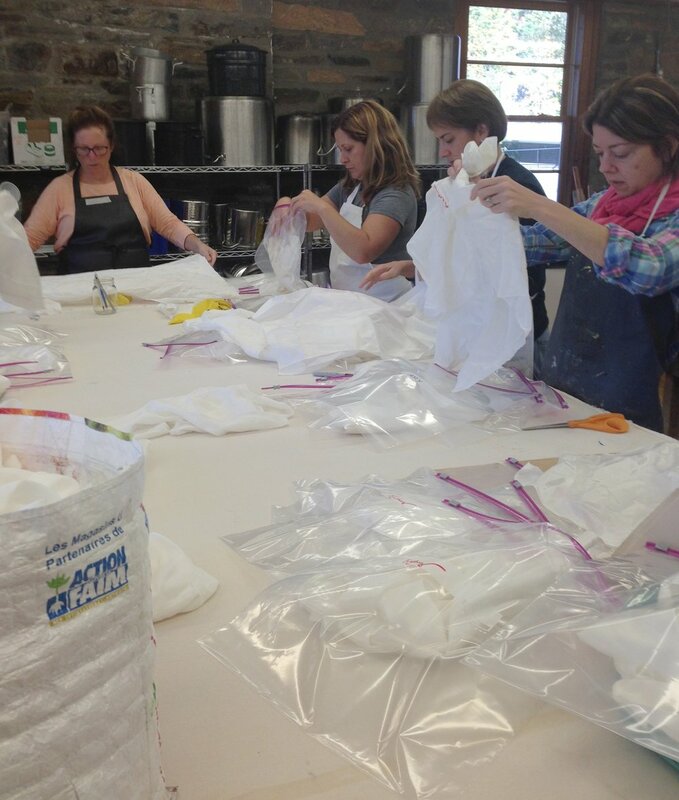 Everyone helped feed the colorful bins of hand dyed silks by taking turns at the dye kitchen. Everyone added complexity to the cloth with words and patterns via simple screen printing. Thirty five of the Penland made scarves were routed to cancer patients and survivors in eleven different states. 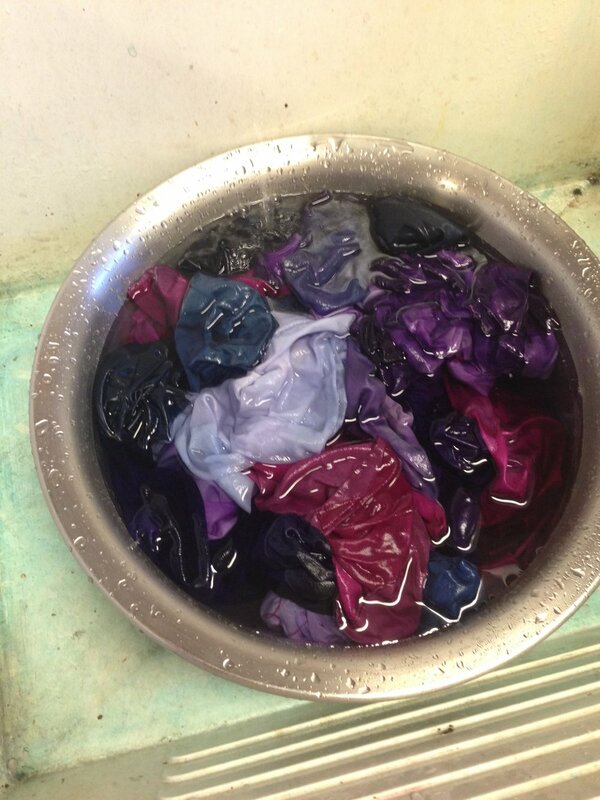 The workshop generated enough dyed and printed yardage to make another seventy five scarves. Mulberry Silks, Carrboro hosted several afternoons of stitching, bringing together friends new and old. Myself and other friends have hosted sew-ins in their own studio/homes allowing us to bring forward another thirty scarves. If you are interested in becoming a partner in a future community-based Wrap project (medical center/hospital, college/university, textile business, art gallery, cancer support group) please CONTACT ME.